By combining the right faux techniques beautiful effects can be achieved. Two faux techniques were used to accomplish this paint finish above. I chose color washing and a rag technique, I found that they work well together. Color wash using a sea sponge has a wider pattern and the rag technique has a more complex pattern. The color wash was applied with a deeper glaze, over a lighter base coat. Then apply a lighter glaze with a ragging technique. Leave areas of the base to show to make the finish more interesting, allowing the tones of color too come threw. Create your own faux finish by experimenting with the different faux tools and colors. Keep a log of all your colors and techniques used so they can be reproduced at a later time. Learn and understand the basics before attempting more complicated finishes. In time you may develop your own personal signature that will be admired by many. This faux painted wall was created from two faux techniques, when combined they form a soft smokey, wispy affect. The faux technique gives an illusion of the mirrors floating on the steam from the shower. The base coat was painted with Benjamin Moore # 1068 eggshell finish. The glaze BM 1070 was color washed with a sea sponge, then an off white glaze using BM 1068 and white was applied over the surface to achieve more depth and soft highlights using a rag technique. Choose three colors in the same family that are a few shades apart, this will produce the depth. This technique can also be used for creating a faux marble finish, add the veining, gloss protective coat and you'll fool everyone. The inspiration to add this metallic painted accent wall came from the small blue grey pillow and bluish color on the bed cover pattern. Originally the walls were a coral color but it was time for a change. The metallic paint, Benjamin Moore # PT-300 Pearlescent tint was applied over Benjamin Moore # HC-148 flat latex using a three inch brush and short random strokes. 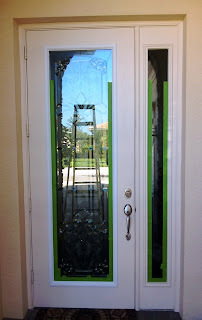 If you haven't used metallic paint before, it is very transparent and works great if it is applied over a similar tone. Another tip to make this user friendly is to apply it with a sea sponge, crosshatch brush strokes or rag technique. If you decide to roll the metallic paint, roll in short random directions. Using various faux techniques will create an interesting and beautiful pattern filled with texture that plays with the light. 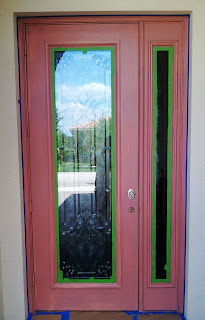 Here are a few tips on applying a Red Mahogany gel stain on a fiberglass door. I found, applying a tinted primer to the surface prior to staining got the best results. The tinted primer is used as an undertone color to enhance the stain. Coral undertones can be used and red depending on how rich of a red mahogany stain you would like to achieve. The door was cleaned with mild soap and water and fully dried, it was left on its hinges during the entire process. You could lay the door over saw horses if you like. Frog tape and blue tape were used around the windows and the walls, hardware was removed and the surface of the door and side light was lightly sanded with 220 grit. The door was wiped down with a lint free damp cloth. I applied a coat of Zinsser 123 water base primer which was tinted to Benjamin Moores # 1209. The primer color will be a little lighter than the actual color. A sample was made before applying it to the door. The primer was applied with a 2 1/2 in brush going in the direction of the grain. This is very important step to remember and used threw out the entire process. The primer was left to dry fully. Old Masters gel stain, red mahogany was applied with a 1 inch artist brush to the moldings around the windows and outer door frame. There is no embossed wood grain so you need to faux grain these areas. Gel stain goes a long way so you don't need a lot on your brush. I started at the bottom and worked my way up and into the previous area, spreading the stain evenly. Have a Cotton cloth near by to wipe excess stain off of your brush. As your applying the stain drag your brush down to produce wood grain. The gel stain will set up pretty fast so you need to work quickly. If you don't like how things are developing take a cloth with mineral spirits and remove the stain. Once the moldings are completed you can finish off the areas around the side light. Work on one area at a time. Now the rails will be stained, top and bottom of the door. Work with a wider brush, a 2 1/2 in. Chinex is great for this. Add gel stain to your brush carefully and apply to the top rail section, from one end to the other. Wipe off any excess that goes onto the stiles (sides) of the door. Remove the amount of stain you need to achieve the results your looking for. Wipe off excess stain on your rag and continue to the bottom rail. Repeat the process. Now your ready for the sides (stiles ) start on the left bottom and work your way up blending the stain into the previous area. Keep several inch away from the end of the stiles so the stain does not build up. I work on a 6 to 12 inch section at a time, wiping my brush and moving in the direction of the grain, paying attention to the amount of stain that I want to remain on the surface. When the left stile is completed its time to move to the right. You will be very happy that the door hardware was removed at this point. Finally the sides of the door will be stained and the inside of the door frame using the same technique. The stain will need to dry thoroughly, which could take a couple of days. Check an inconspicuous area with a little mineral spirits on a rag, if it comes off its not ready for the spar varnish. Once dry, apply good quality exterior spar varnish ( oil base ) satin finish with a clean Chinex brush. Two coats will be needed, let the first coat fully dry. Drying time will vary depending on the weather. The varnish is applied in the direction of the grain. It's a good idea to move in the same sequence as the staining process. When the varnish is dry use a razor knife to score along the edge of the tape, this will help in removing the tape from pulling up your hard work. Put back the door lock and hardware and your all set. Note: Put the rags used with mineral spirits or stain in a metal bucket of water when finished, remove according to local disposal laws. This door was stained on the exterior side and painted on the interior side. Follow the same process if staining both sides. Make a sample board of the entire stain process so you can see how things work and what needs to be done to achieve the right results.